Absolutely no surprise to know Manchester City is a team we want everything of. Burnley had a horrible start to the EPL season, but has remained unbeaten the past 3 games in the league. With that said, to travel to the Etihad thinking anything but 2-5 goals are going to be scored against them is just crazy thinking. 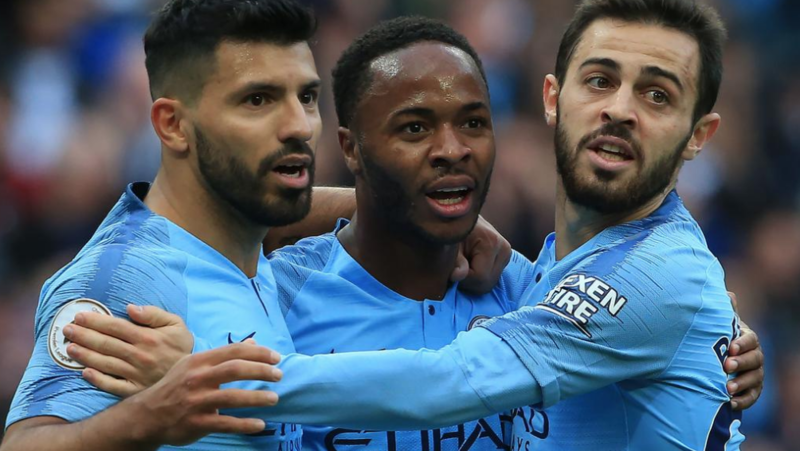 Aguero and Sterling is where the upside is going to be for City. Aguero is purely a goal scorer and he could easily bag a couple goals here. He is a top price forward and there are a lot of people to pay for. The strategy will be to roster Aguero and fade majority of City, or roster 2-3 City players, but as a result fade Aguero. I do really like Sterling, and although Sane is usually the player everyone tends to go to in cash games, he has seen a lot better productivity despite not being on any set pieces. Ideally, rostering Aguero and Sterling is what we should all like, but you will have to find major value throughout the rest of your lineup. DeBruyne will remain out for City, leaving set pieces to David Silva or LeRoy Sane. I really like Silva on FanDuel, but he will not come cheap. Fernandinho will also look to get the start in midfield with Gundogan most likely a doubt. That should be a FanDuel only play unless you are really punting on DraftKings. Ederson is right now projected to get the start, Burnley hasn’t been all that dangerous offensively, but I do think there are cheaper options than Ederson to roster. Only roster if you have the extra salary to spend. Liverpool couldn’t have asked for better timing for the international break as they had been winless in 4 straight games. They also couldn’t have come back to a better matchup against Huddersfield Town. Huddersfield have scored only 2 goals this season, and have yet to win a game. Liverpool picked up a lot of knocks during the international play so it will be interesting how Liverpool’s starting 11 looks come the time lineups get announced. Of all the knocks Keita and Mane are the ones that are currently expected to miss out on the match. If that is the case, Shaqiri could be moving up into the lineup as a forward. He comes at some value, although he has been pretty unproductive for Liverpool so far this season. He would be great to grab some exposure to the forward line at a better price than Firminho and Salah. Speaking of Salah, he did pick up an injury, but he is expected to play right now. Make sure to keep major tabs on him as this should be a fairly easy match up for Liverpool and Klopp may not want to risk aggravating an injury for Salah against a Huddersfield team. There is also a lot of questions from the midfielder side of things. With things being mixed up due to injuries, Milner could be expected to get into the starting 11, and this could be the week we see Fabinho make his full EPL Liverpool debut. You can always count on Alexander-Arnold and Robertson pushing the offense up the field, but they don’t come cheap. Alisson makes for an interesting keeper play, but again comes at a high rate. He should be lined up for the win and good chance at the clean sheet, I don’t expect anything extra to come from him. Will It Be Easy For Tottenham? Tottenham have gotten back on track and are right near the top of the table. Kane has dialed down his value compared to last season, where his plethora of shots isn’t enough to give him an absolute solid floor. He was in good form before the break, but with Aguero very similar priced, Kane may be more of a tournament play rather than cash games. The midfielders all come at really nice value on DraftKings, not as easy to fit in on FanDuel. Eriksen has been giving a solid floor and has been a great overall playmaker for Tottenham. Expect Alli to be out for this match meaning just more usage for Eriksen. In replace of Alli, Heung-Min is most likely going to get the start over Lamela. Heung-Min is a lot more of a tournament look, along with Moura who will resume his normal starting spot. Moura has been in great form and is still much cheaper than Heung-Min and of course the rest of the attacking Tottenham players. For exposure to Tottenham, Moura is a nice piece of the puzzle. Ben Davies is expected to be back in the lineup, meaning he will take away from what Trippier has been doing over on the opposite side. Both are a little pricey of defenders, but both are very much associated with the attack. Moura and Heung-Min don’t play the sides as much, so it makes Trippier and Davies really get some upside in the crossing game. Just to touch on West Ham for a moment, you can find Anderson and Yarmalenko at a pretty solid price. The most intriguing is Arnautovic, he has consistently been a pretty cheap price, and launches anywhere between 2-5 shots on goal. West Ham has looked pretty decent this season and it is very much expected that West Ham will be able to bag at least 1 at home. It is incredible how big of an impact Bournemouth has made in EPL this season. They have not only been winning, but scoring good chunks of goals while they have been doing so. A major piece of that puzzle has been Ryan Fraser, who has been on absolute fire for the Cherries. He withdrew from the Scotland team during the international break, so his status is currently up in the air. If he is out, Bournemouth could be accelerating the return of Stanlislas, so he can feature as a solid playmaker. King and Wilson continue to lead the front line, and continue to trade performances really. As much as I love to stack these two it seems that it is almost unproductive. Regardless, if Fraser ends up being out that is most likely exactly what I will be doing. King has finally picked up his peripheral stats since having a horrible start to the season, and Wilson’s production has levelled off a lot more. Brooks continues to impress me and has now seen a $2k+ salary increase since the beginning of the season on DraftKings. If Fraser sits, expect Brooks to take on a little more leadership to lead the offense. On FanDuel there is also attention to Lerma since he took on a bit more of a role for the club recently. I like Begovic this week even though his skills in net aren’t always great. Southampton takes shots way outside the box and in chunks. Begovic has been good enough to grab some rare clean sheets and although I think he will be tested there is a lot of potential upside that comes with him. Francis, Smith, and Rico all continue to battle for a spot as the wing backs. Francis and Smith come at a lot better value than Rico. The Cardiff City v. Fulham match takes place for two of the bottom of the table teams, but it proves to be a very important match for both teams. Cardiff has yet to win a game this season and they have a solid chance at home against a Fulham side that concedes a lot of goals. Fulham on the other hand, although they concede goals, they also score them. Both teams see an average of 3.75 goals per game. Now a lot of that is scored against them, but they also score to help boost that total. It will be interesting to see the strategy that both teams come out with and if Cardiff will match Fulham’s aggressiveness. For Cardiff City, Ward may or may not be playing, but I am not interested in him at all, it’s more so if Paterson gets the start, I like his aggressiveness where he puts an upward of 5 shots when he starts and comes in extremely cheap. The most intriguing option by Cardiff City is Josh Murphy. He has now made 3 starts for Cardiff, and has anywhere from 1-6 shots include 3-5 crosses. He is in attack mode. Hoillett and Reid are some cheap options as well, with a greater lean towards Hoillett. However, with the addition of Murphy, Hoillett has seen a decrease in usage on the field. Now Fulham…Mitrovic seems like a pretty obvious go, and even for cash games I think he is good enough. He is pretty cheap and his likelihood to score is higher than even Vegas has him at, I truly believe Mitrovic can score against even the best of teams and Cardiff is no where near that standard. Vietto and Schurrle support Mitrovic on the wings, and are just as productive in a lot of cases. You can pretty handily stack Fulham or pivot off of Mitrovic where there will be less ownership on those players. Seri is as safe as it comes for Fulham, he offers a really nice floor, but his upside has proven to be limited due to lack of shots. Stay away from Sessegnon if he moves back to a full back position, and instead go for Christie who has seen better form as of late. Lastly, Bettinelli hasn’t been the greatest of keepers, but Cardiff hasn’t been prevalent with scoring and Bettinelli should see some shots on net. He is a keeper I don’t mind taking a risk on in tournaments. Moutinho – I have been so impressed with this Wolverhampton team taking points away from both United and City. They now get a matchup at home against Watford, which will most likely be a defensive battle. Both teams play very similar styles, aggressive, but defense first. Moutinho has taken just about every set piece away from Neves and provides a really solid floor. Wolverhampton – Deeney, Hughes, and Pererya all have pretty similar offerings and are all in decent form. It is going to be a tough match for them, but if you happen to stumble in their price range, don’t look to play lower than them if you don’t have to. Masina – Fullback for Watford, right is set to make the start in place of Holebas. He is as close to minimum price as you will get for a fullback, so for his price, he has potential and upside, especially with the position he is filling. Shelvey – Newcastle has been playing very conservative, and I am slightly concerned their match this week ends in a low scoring draw. Shelvey has taken a lot of set pieces and is leading the attack more so than Ritchie. Jahanbakhsh – The Iranian is finally playing some good minutes and expected to be in the starting lineup. He has yet to play well at all, but Newcastle should be able to have some holes open up for him to take advantage of and showcase more skill than what we have seen so far. I don’t like his price being as high as it is, but worth a shot deep in tournaments.